Once upon a time, there was a fun and modern couple who spent months and months planning their dream wedding. The dress was to die for, the flowers were just right and the reception details were the perfect blend of the two – a little bit she, a little bit he – but there weren’t any pictures to prove it. That’s how Danfredo Photography was born. 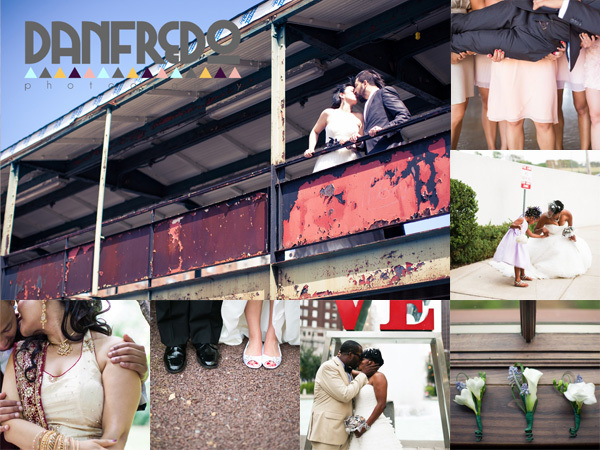 We’re Danielle + Wilfredo Rivera, a husband and wife wedding photography team based out of New York City. For us, every wedding is an opportunity to photograph awesomely in love couples in the moments we would’ve wanted to be able to look back on from our own celebration. Through our eyes, your wedding day is story-driven, people-centered and detail-oriented, all captured through a creative and critical lens. We’re emotionally invested in your vision from the first email to the last dance and beyond. We’re going to laugh with you. We’ll probably cry with you. And we’ll most definitely be friends for life. Let’s do this! Danfredo Photography | Classic Photography For Fun + Modern Folks. I would 100% recommend Danfredo Photography to everyone I know needing a photographer. Danielle was our photographer, upon meeting with her I explained to Danielle what kind of pictures I like (creative, fun different) along with one specific shot I had seen in the past that I definitely needed to have. She listened intently as we went over my vision and I knew after that initial conversation that my wedding photos wouldn’t be anything less then amazing. The day couldn’t have gone any smoother. I’ve taken other professional pictures and it’s a lot of sit pose smile/kiss and sometimes it’s stiff and un natural feeling. I didn’t feel that way at all with Danielle, we had so much fun taking our pictures it was just me and my husband being ourselves and she really captured some amazing moments. On top of that she didnt miss a detail of our wedding. Looking through her photos I saw some stuff I had missed the day of! I cannot even tell you how well she can capture people in the moment, the action shots of everyone dancing are even a piece of art. And as for that one specific shot that I had to have, well no surprise she nailed it and then made it even more stunning then what I envisioned. If having someone who makes you feel comfortable with them AND taking great pictures was enough she was on top of all the little things too. If I had my bouquet on me on the dance floor she woudl take it and put it back at my table because who wants to dance with a bouquet all night? Did someone hand the bride a card in the middle of the dance floor? Of course they did, but within seconds it was out of my hand and straight into my card box thanks to Danielle. She didn’t miss a beat and my wedding would not have been complete without Danfredo Photography. I would recommend Danfredo Photography 200%. She was not my “hired” photographer and I regret not having had the right time to know her and hire her as our photographer for our big day. I was only exposed to some of her photos after my husband and had already hired our photographer. I also had the luck to have 2 people cancel last minute and I was able to invite her to come as a guest but to also bring her camera. Needless to say, her and her husband made a big effort to make it to our wedding last minute. And what a blessing that was. She did take many photos, and I can say that I loved every shot. My photographer just gave us our proofs this week. I was very disappointed to see all 700 shots and I could only pick about 10 photos. Again, we were blessed to have Danielle there with her camera. I have already printed some of her shots which currently decorate my work desk and some corners of my home. I am looking forward to our “trash the dress” shoot. I cannot wait to have her take pictures of us again. Thank you again from the bottom of our hearts, we couldn’t be more grateful. I LOVE DANFREDO PHOTOGRAPHY! Danielle and her husband/partner Wilfredo took our engagement photos. We wanted a “Breakfast at Tiffany’s” theme, recreating shots from the film around New York City. She worked with us to do exactly that, even researching the movie and suggesting some scenes I hadn’t thought of. Danielle and Wil were SO EASY to work with – we’d never done anything like this before and they made it fun! The photos look amazing – people keep asking us who took them and of course I’m happy to spread the word. We have hired Danfredo Photography to do our wedding and we couldn’t be more thrilled and excited since photography on the big day is so important to us!! Danielle was a pleasure to work with. Her and her team were so professional, kind, thoughtful and soooooo sooo talented!!! She came to my bridal shower and took pictures that really caught the emotions of the day. And for that I am forever grateful!!!! If there were more stars to give to rate her talent and total package, I would!! Love her and her team! Danielle & Wil are amazing photographers! I booked them for my wedding on 9/15/12 and I cried when I saw my photos! They also did an engagement shoot for us and again, the photos were UNBELIEVABLE! Danielle has such an amazing eye and the way she uses natural light and shadows is absolutely beautiful and makes for breathtaking images! The customer service they provide is unmatchable. They go above and beyond to make sure they capture the perfect picture! They were such a delight to work with and were very natural – we hardly even noticed the cameras at our wedding (although you would think the opposite by the quality of my photos)! Danielle is super-organized, has incredible communication skills and has all her “Is” dotted and “Ts” crossed! I will definitely be using them again in the future for maternity and family sessions! Just want to say Bravo and WOW! A++++++++++++++++++++++++­+++++++ Thanks for the forever memories! I can’t recommend Danfredo Photography enough, we plan on using them again when we start growing our own family.